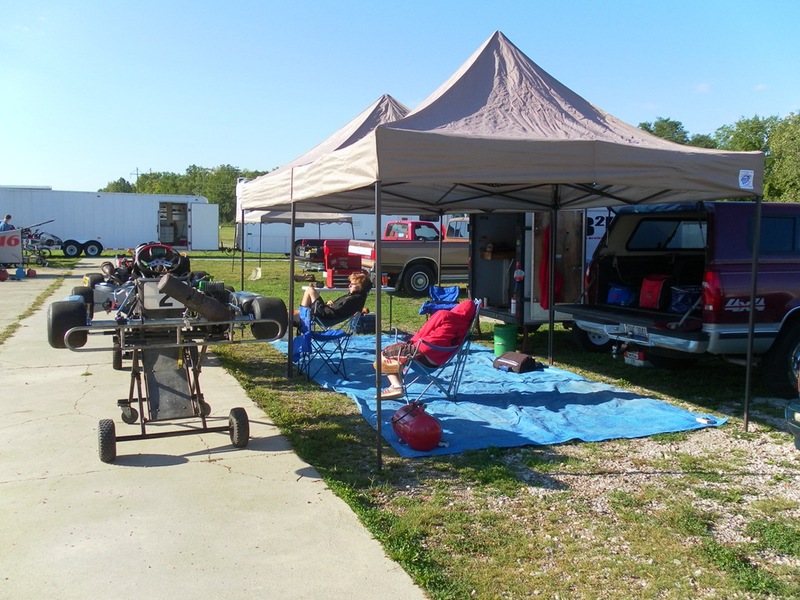 The Commercial Point Karting Classic (website here, Facebook page here) is this coming weekend – August 3 and 4, 2013. The CPKC (formerly the Commercial Point Grand Prix) has been the highlight of the season for Bruce Brothers Racing for the past few years. Peter and Conor will both defend the clean sweeps they had in 2012. The schedule for this weekend is posted here. Peter's class is Spec 100 Pipe and Conor's is 80cc Shifter. Practice starts at 10:00 am on Saturday with the second practice acting as a timed qualifying session for the heat races. The heat races on Saturday are scheduled to start at 2:00 pm. The schedule can vary quite a bit, but if I had to guess, I'd say that Spec 100 Pipe will start no earlier than 3:30-3:45 pm on Saturday and 80cc Shifter will start no earlier than 4:30-5:00 pm. It takes some time to park and get settled, so keep that in mind if you plan on coming down. Admission is free, but if you choose to buy a pit pass, we have canopies for shade and plenty of folding chairs in our pit area. We have a reserved spot which should be reasonably close to the grid area (where karts enter and exit the track near Turn 1). Feature races on Sunday are scheduled to start at 1:00 pm. I'd guess that Spec 100 Pipe will start no earlier than 2:15-2:30 pm on Sunday and 80cc Shifter will start no earlier than 3:15-3:30 pm. Both boys are entered in the pro races after that – I’d guess 4:00-4:15 pm and 5:00-5:15 pm for Spec 100 Pipe and 80cc Shifter, respectfully. Come on down and enjoy the racing action. p.s., Our pits look like this, except it's all grass at the CPKC . Unfortunately, I did not get a video of Peter's feature race win in our Spec 100 Pipe kart two weeks ago during MSOKC Race No. 7. NEWS – While this race report covers Race Nos. 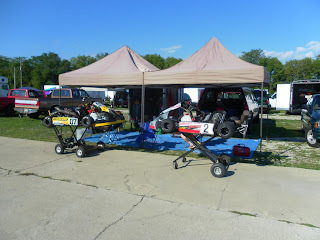 4 through 7 of the Mid-State of Ohio Kart Club championship, Peter and Conor competed in only two of these. Race No. 5 was rained out (postponed to August 25) and the boys decided to miss Race No. 6 so that they could spend some extra time with family in Kansas City prior to returning to Columbus for the 4th of July holiday. MSOKC Race No. 4 – Race No. 4 featured standing starts for all classes, like the shifter kart class does at every race. Peter was fast in our Spec 100 Pipe kart during the morning practice sessions but seemed to lose speed as the day progressed. He started his first heat race from the fifth position (of nine in his class that day). He dropped a position at the start and another on Lap 1. He gained one position back on Lap 2 and another on Lap 4 and ran in fifth – where he started – to the finish. Peter started fourth in his second heat, dropped two positions on Lap 1 and finished sixth. A fourth and a sixth was only good enough for the sixth starting position for Peter’s feature race. He maintained his position at the start and ran in sixth until Lap 9 (of 10) when he gained a position when the kart he was chasing dropped two wheels into the grass at the exit of Turn 6. He gained another position on Lap 10 when the kart that had been running in third came to a stop in Turn 9. A fourth place result was not so bad when you consider that we later discovered a leaking head gasket on Peter’s kart which was causing a loss of power. Conor was also fast in our 80cc Shifter kart during the morning practice sessions. In his first heat race, he started third (of seven), made a pass for second on Lap 2, another pass for the lead on Lap 4, and went on for a comfortable win while setting the fastest lap (45.829 seconds) along the way. Conor started fourth in his second heat and had worked his way up to second on Lap 3 when a kart he had just lapped punted him into a spin in Turn 7. He recovered to finish fourth while again setting the fastest lap (45.771). A first and a fourth earned Conor the third starting position for his feature. The kart in the fourth starting position appeared to jump the standing start but was not penalized. It took Conor three laps to get back around this kart and another few laps to make his way into second. He spent the last four laps chasing down the leader but came up short by just over a second. MSOKC Race No. 7 – Race No. 7 was a normal heat race event at Circleville Raceway Park. The weekend before, Peter and I had visited Wilmington Raceway Park to confirm that his engine was okay after we replaced the head gasket and to break in a new set of brake pads (on-board video here). For Race No. 7 at CRP, we started him on well-used tires to compensate for the large amount of mechanical grip his chassis generates and he was once again very fast in the morning practice sessions. Peter got a great start from second (of eight) in his first heat but had a lurid slide in Turn 1. This allowed the pole-sitting kart to get away a bit and the third place starter to pull alongside Peter. What happened next was nothing short of remarkable. Peter and the third place starter went side-by-side through Turn 1, Turn 2, Turn 3 – you get the idea – all the way to Turn 7. Peter was on the outside in Turn 7, which gave him the advantage of the inside for the uphill Turn 8. Two karts rarely get through two turns side-by-side at this level, so it was refreshing to see such clean racing. Peter caught and passed the leader on Lap 5 (of 8) and went on for the heat race win. Peter’s second heat was pretty exciting, too. He started fifth but dropped one position at the start. He made two passes on the opening lap another on Lap 2. He ran in third until Lap 6 when he was able to make another excellent pass under breaking going into Turn 5. A first and a second earned Peter pole position for his feature. He maintained the lead at the start and put his head down in an effort to pull out a gap. The first two pulled away from the rest over the first few laps but Peter couldn’t pull away from the second place kart. He did just enough to lead from start to finish for his first feature race win of the season. Conor also had used tires for Race No. 7, which were actually from the 2011 season, but we were pretty sure that they would perform adequately since they had only done 28 laps. He started his first heat from the eighth position (of 10). He made two passes on the opening lap and another on Lap 4. He gained another position on Lap 6 only to lose it again on Lap 7 while attempting another pass. Conor’s second heat was a lot less hectic. From the second starting position, Conor grabbed the lead at the start and led every lap for the heat race win. A fifth and a first was good enough for the second starting position for Conor’s feature. He once again grabbed the lead at the start and led the first few laps fairly easily. The fifth place starter, who had been fast all day, had made his way up to second by Lap 5 and caught and passed Conor, who was now struggling for grip on his old tires. While trying not to lose another position on Lap 6, Conor had a lazy spin at the exit of Turn 5. He was able to keep the engine running and recovered to finish sixth. NEXT RACE – At the mid-way point of the season, both boys have had some encouraging results but some bad luck as well. MSOKC Race No. 8 is Sunday, July 28, 2013, and will be another normal heat race event at CRP. After that, there is just a short six day break until the Commercial Point Karting Classic (formerly the Commercial Point Grand Prix), which has been the highlight of the season for us for the past few years. Details will follow soon. p.s., Lap times, lap charts, and results can be found here and here.